As predicted, Wednesday's normally seasonally-bullish session turned into a big red candle. That in itself should tell us something about this market, as that marks only the second time in ten years that the Wednesday before Thanksgiving has been negative. The only other time that's happened in the previous nine years was in 2007, during the prior down leg of the Great Bear. 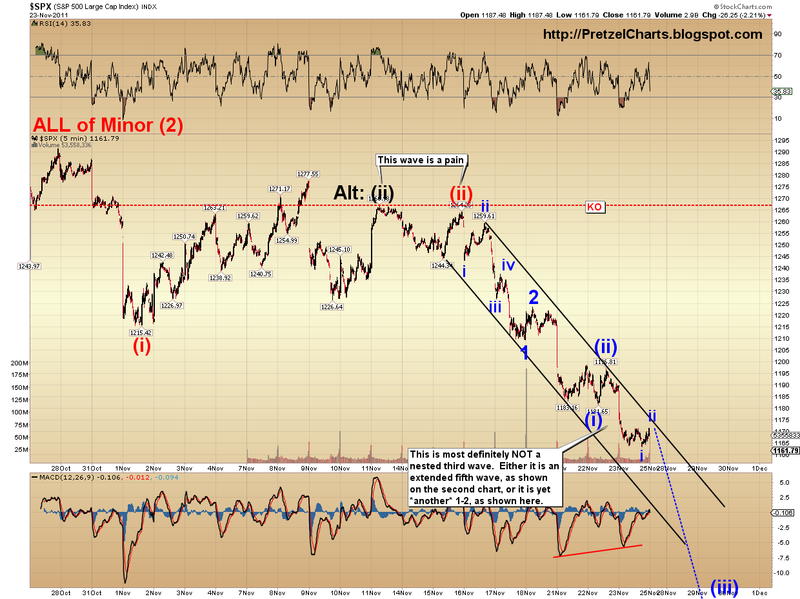 Option 1) The market has been forming a fifth wave extension, and could see a strong counter-trend bounce soon. Option 2) The decline hasn't yet seen the internal third wave. This would have immediate and exceptionally high bearish implications. The challenge I'm running into right now is ambiguity across markets, from currencies to equities. If I had to make a call, I would continue to lean toward the more bearish short-term outcome, as I have for some time -- but the charts are almost a toss-up at the moment, more so than they have been previously. Friday and Monday should hold the answer. Long and medium term, I remain bearish. My short-term stance is described above. If the market can't generate a bounce from somewhere near the current levels, it is almost certainly in very deep trouble, and we should see strong acceleration in the decline... or an outright crash. Incidentally, the Euro is in a similar position. It needs to get back above 1.33, and then 1.35, pretty quick -- or 1.10-1.15 becomes fair game. Let's look at the two possibilities for SPX in chart form. The first chart depicts the fifth wave extension (option 1 above). This chart suggests a short-term bottom is near, and predicts a decent retracement rally, which would likely carry all the way back up to 1215-1222 before the decline resumes. This count flies in the face of my belief that we wouldn't see any significant rallies during this decline, but I have to stay true to the charts. The second chart (option 2; chart below) depicts an ongoing nest of first and second waves. This count is downright scary, and would suggest the bomb bay doors are about to open on this market. I would suggest paying attention to the black trend-channel for clues. A clean break up and out of the channel would tend to favor the count shown above; a break below the channel would favor the count shown below (see how easy I made that?). In either case, until the top trend line is broken, there is really nothing to suggest a trend change over the short term, and the first chart (shown above) remains a hypothetical. Over the holiday, a number of readers inquired about the VIX, and how it seems to be unresponsive to the decline. Using history as our guide, and given the market's position within the big picture waveform, this apprears to have happened the last time as well. I have created a chart which shows 2008, the last time the market was in a similar position in regards to its wave structure. The wave we are currently in is believed to be black Wave 1-down of red Minor (3) down, which should make a new low in the SPX 1000-1050 range before bouncing in black Wave 2-up. In the chart below, we can see that last time this happened, the VIX failed to make a new high, even as the SPX made a new low. Of course, it is still not possible to rule out the short-term bullish alternate count, and will remain so until the market completes five waves down at higher degree. (See: SPX and NDX Update: Crash Wave Finally on Deck). I continue to assign a 15% probability to this bullish count, but again, the market's in the area where that count could bottom, so I would suggest that some degree of caution is in order, as the bullish count would generate a rally back up over 1300. At the moment, we have a market that has left its short-term options open. Friday is another "seasonally bullish" day, with data going back to 1941 indicating that the post-Thanksgiving Friday is green 70% of the time. The Crash scored a touchdown on Wednesday, after Seasonality got flagged for too many false starts. Can it score another tomorrow, or will the bulls regroup? As Chris Berman would say, "That's why they play the games, folks!" The bottom line is the bulls need to get in the game, and fast, or the bears are going to run the length of the field on this one. Trade safe. read your blog for a couple of months, am a newbee att trading but find it wery facinating ecpecially since I found you. Learned a lot, your a very good teacher. My trading is more of the 1-3 week range than daytrading. Have some questions if I may, your RSI/MACD is in bullish positive divergence wich should lean towards a more bullish Short term outcome. However the RSI/MACD was "bullish" between 21-23 nov with a sideline correction in the SPX. # Would you say this is typcial for a waterfall decline a bullish RSI/MACD (and the outcome of the bullishness will only be sideline corrections?) as we are (if we are) in a bearish market mid-long term. # Have you any information how the RSI/MACD behaved just before the "Bombs away" in the beginning of okt 2008. (Maybe my questions are irrelevant, but as I explained - im a newbee). Morning, DanC -- yep, back to work. The bullish divergence could fit either scenario, so it doesn't really help in the analysis. During 2008, RSI formed similar "bullish" divergences the whole way down on wave 1 of (3). What's unusual is this would be really early for a full-blown crash-type move. But then, this is a 3rd wave bear market instead of a first wave. Like I've said previously, none of us have seen a bear market at this degree, so I'm not really sure what to expect at times. Good morning Pretzel and others. Hope all who celebrated Thanksgiving enjoyed their day. Looks like the USD may have broken out of it's rising wedge -- which could be another pointer to your more severe scenario. Also Pretzel - you asked the question last week or earlier this week - can't remember but I thought it was a great question and I was curious how you answered yourself -- the question was something like - how should wave 1 of 3 compare to wave 3 of 1? Never really got a solid answer from myself on that one, POTUS (I would complain to somebody, but who would listen?). It's really more of a hypothetical "hmm," I guess. I've got to make a quick run to a Black Friday deal before the open here. Barring ridiculously long lines, I should be back roughly in time for the open. Feel free to talk amongst yourselves, and don't forget about the cool real time streaming quotes on the right sidebar. Morning everyone. Eur continues as the big tell. Happy hunting PL. Thanks for adding the quotes/charts :). I have to agree, Sir. The one area of disagreement is over the VIX comment. I acknowledge that a lower high vs. four months previous does indicate less fear and volatility as it did at the 2009 stock market bottom, but in a daily sense, the VIX climbed in a daily trend from mid-May to mid-July 2008. That's not what we're seeing now though. I haven't yet found a similar example, but it certainly looks to me like the VIX is getting ready to make a big move one way or the other. Cheers. I have to say, watching eur trade, market still looks extremely unhealthy to me. Having equity markets move 1% a day is one thing, currency markets, especially an established pair like eur/usd, moving around 1% a day is astonishing. It's also gapping, which is even more astonishing. It went from 1.3261 to 1.3257 in a flicker at one point. IMO, VERY unhealthy. Today could hold together on short-covering in eur, i think Monday will be fugly. Long term I agree with Cullen, but think we could see a strong rally starting now and perhaps even extending to SPX 1330... from which aggressive shorts should be started. Btw, Cullen this would I believe coincide with your minor 2 DAX target of 6600. Go Jaco - you would be correct sir. This move down will look JUST like the move up - big down days, a pause or slight up day to digest the move and back at it. Now chance to go long and no better spot to short. Matt, I'm not sure how big the bounce will be but intend to add to LT shorts on the way up from here. However, I give 1330 no more than a 10% chance--more likely 1218 to 1246. Just found your site and always enjoy your hard work! With option 2, are you targeting 1000 on the SPX (per your previous post) or lower if the market were to follow that path and decides not to bounce here? I do believe that we will reach all time highs in the SP. I postulating that it will be in the year 2121. :-) Or when the Bernanke decides to print enough money for our dollar to become parity with the Zimbabwe Dollar. Whichever comes first. I hear your words of caution. The thing that I hate about shorts is how so quickly the market can snap back. That said I really think that the divergence of the indicators is quite typical here as are short covering snap backs. I still favor your 1000-1050 target for the SP. The only reason I am saying a bounce could happen is because overall bearishness is reaching high levels and more importantly started to increase before this decline. The second point is that judging from the current mood I feel like any surprise lies on the upside, with downward pressure already priced in. But yes, I could be wrong, but I just like to form my own opinion. i dont think vulture was edgy, he was just stating his opinion. Anyhow, his comments are no where near anon20's. Hello from Europe, found your interesting blog a few days ago and am looking forward to see this elliotwave adapt in real-time (even bought the principle book). Maybe it helps in combination with price/volume observations a la Wyckoff. Also ever thought of using Asian markets instead of US for better working hours? there goes eur 1.3250, we'll be down for the day when it's all said and done, IMO. And I am NOT Anon2o in disguise - I'm trying to protect the brethren from putting longs on ! Okay, I'm back. Euro not playing along with SPX so far. I agree with you. I think a bounce to 1200 is highly unlikely. Lets see what PL has to say when he gets back. check out the Sentiment Survey vulture 711: it ended at 32% bullish vs 38% bearish. Here in Europe the atmosphere is gloomy after a string of failed auctions and sov. yields soaring.. There was enough ambiguity in the charts for me, and enough of a chance of a bounce, that I covered my ES shorts at 1150 last night. I'm pretty much flat right now (still holding a few shorts), waiting for a little more guidance from the market. I don't like gambling when I'm more or less 50/50 on direction, I'd rather protect profits if I can get a clean exit -- pretty much everyone knows I've been looking for one at 1150 +/-. But once I have a better feel for ST direction, I can always get short again -- either from much higher levels, or "pick up where I left off." Pretzel, since you are back, do you think scenario 1 or 2 is looking more likely at this point? Are we close to a wave 2 rally? Or are we still diving further from this nested i-ii curse? I am Satan. And Proud of it. I am the Ultimate Contrarian. And when you call MY name, I Enter, to Seek your weak soul. I am the Ultimate Vulture also. I will Devour your weak carcass. Do not Ever use MY name in vain again---or I'll crush you to a pulp. Hi Matteo, you have a point, but I want to say that sentiment indicators are at best secondary. Price action is foremost in TA. Matteo -- first off, welcome! Regarding sentiment -- just as bullish sentiment can run to extremes and stay there for a long time during a bull market, the same is true in reverse in a bear market. What I look for is high bullish sentiment in a bear market; that usually helps mark a top -- or the reverse in a bull, usually helps mark a bottom. But when the sentiment extreme is in line with the primary trend, it MAY mean something... or it may not. It's really more something I personally use to confirm chart patterns; other than that, you can get slaughtered trading sentiment, because it can remain at extremes for a long time. As long as Euro holds the breakdown, I would tend to agree that this is just light-volume shenanigans by da Boyz. SPX still in the trendchannel -- in fact, that's what stopped the advance. Had I been here, I'd have shorted it. :( But hey, I saved like $50 on an outdoor firepit and another $50 on toys for the kids... LMAO. As long as it stays in the channel, there's no sign of a trend change and it's guilty until proven innocent. Hahah yes yes.. the trend is your friend, at least until the end when it bends. PL wrote: "...But then, this is a 3rd wave bear market instead of a first wave. Like I've said previously, none of us have seen a bear market at this degree, SO I'M NOT REALLY SURE WHAT TO EXPECT AT TIMES. " (CAPS mine). ANON20 answers: Because your work is solid, I will assist you, in to what "...to expect at times...", in a g.s.c. wave3, 2011-2012. 1. On questions on oct. 1987 day by day leading to crash, you can ask ME directly, a foreigner. 2. On questions on oct. 1929 day by day leading to crash, you can read american f. l. allen's 'since yesterday', originally published 1939. 3. On questions regarding day by day leading to crashes of Dutch tulip mania, Southsea bubble, and Mississippi scheme, refer to the master work, a 700+ page tome, of britisher charles mackay 'extraordinary popular delusions and the madness of crowds', originally published 1841. Also, the rally was only 3 waves, which would tend to indicate it won't hold. Question about the bigger picture in terms EW: The Oct4 rally - is it a C wave up as we discussed previously when we are trying to figure out the "top", or is it now a Minor wave (2)? The A and B corrective waves were embedded in Wave 4 of Minor (1) ? Sorry I am still a little confused. I tend to agree this looks like 10/87. Thursday '87 was down but not crash and had been down multiple days before that, Friday volatile but ultimately finished close to where it closed Thursday and Monday -down 22%...We'll see, gov'ts / CB's much more active today than they were in '87, they may give the patient more drugs (liquidity) to mask the problem. But if they're waiting for sp 1000 to announce QE3, they may miss it if we go straight through into low 900's Monday. Then they're announcement may not have the desired effect. The nascent black Friday rally just got killed like that.. not a good sign for bulls. Well, got short again at the break of yesterday's low. Might cost me a few points if it's the extended fifth and I stop out, but no indication of a trend change yet -- and I look at it as gaining a few points since I covered a bit lower last night. The fact that the bulls couldn't put anything together here on the low volume "bullish" day is not a good sign. In S&P 1/2 hour at 110 down and 2hours at 220 down, market closes at 330 down. At least that is what I can make out. Also, that would be Wednesday's low, obviously. When I look at the charts, it's "yesterday," lol. Not surprised. Their waffles have really hit the skids lately. The Euro's trading like a penny stock lately. I agree that the pattern the VIX is displaying isn't the same as '08. I was attempting to illustrate that in relation the wave position (1-down of Minor (3)), it's not unexpected that the VIX isn't rising more aggressively. btw, welcome Dale and rob! 5% weekly decline on what is historically one of the BEST weeks of the year. Bully was what he ate this week (get it? Turkey! Ha!). So wave 4 and 5 of Minor (1) is the same as A-B, and C is the same as Minor (2)? No. But you could say C would be Minor (2), that part was okay. I guess my annotation on the second chart should read, "as shown on the first chart" lol. I need a proof-reader. Still a little confused. So the corrective wave don't have to be A-B-C kind of waveforms, but could be a clean 5-wave patterns at times? I'm gonna go hit the hay for a few hours. PL, thanks for the welcome. I like your sense of humor and your insight seems "spot on.". I am fairly new to Elliot wave but not to TA. I probably won't post many comments because I really don't know what the hell I'm talking about. I certainly don't want other people following my advice. After all, I'm still attending my asset allocation annonomous therapy sessions (4 years & counting). lol, forgot to close my positions today for the weekend, since I was thinking 1pm PT time not ET time; oh well. Considering how weak the market is, I don't expect my long puts will take a hit on monday's open. PL: do you think the market is "going as planned"? If so, we should start thinking about a curveball coming soon. The market, as you know best of us all, tends to do that. But, what would that ball be? Certainly an up-rally, but how/when? ps: also note that the S&P stayed exactly in the trend channel PL made for us. It nudged on 1172, exactly where the black upper channel goes for today and dove straight down again. I'd be surprised if it breaks above on monday. Up days are of course possible within the channel and stranger things have happened. But what good news is there to lift it all up. It's QE3 or nothing IMHO. Thanks PL, I'm of the opinion that option 2 has a higher probability of occurring, given we've tried bouncing each of the past 7 days to no avail, FX markets are leading us towards the October lows and ES is very rich to many asset classes right now, looks like it has some catching up (rather down) to do. As always look forward to your insight. Hi PL, Just stumbled on this site couple of weeks back and since then amazed by the precision and confidence you have on the next MKT moves. I have a question on a possible bull scenario here. The setup looks exactly like last year Sept 1st, where market rallied from 1050 to 1370. Any comments on this possibility? I agree, Vilture wasn't edgy and yes anything is possible, but 1330 is quite a distance from here... And all I have heard the last couple of days have been this bounce from 1150. And of course it could still happen, but when everbody (including me) expects something, the opposite often happens. I have to say it as this point: the dollar looks like it's in the midst of a nested third wave up. I've been trying to see it as something else, because my bias is to see it as a third wave and that's what I've BEEN seeing all week -- but it's just becoming almost impossible to see it any other way. If I had no bias, and just started looking at dollar charts yesterday, I would say "nested third wave." Bully could have real problems next week. PL, not to sway your thinking, but definitely looks like the DX could run and make bully have some problems next week. Rob, ty, not "swaying my thinking" at all. I've been a dollar bull since late August. So when I say my bias is to see the dollar in the middle of a nested third wave up, that's why: I've been predicting this move for months. When things go perfect is always when I pick my own work apart the hardest. It's so easy to get blind to other options when things are going the way you thought they would -- and I think that's dangerous. So that's when I try to play devil's advocate against my own bias, and challenge my preconceived projections -- *ESPECIALLY* when they're playing out to a tee. Nice calls PL! I'm a DX bull as well, if the DX can successfully mount the early October highs this week (which shouldn't be too hard), it looks like it would not only lead to a significant rally as you noted in your link, but also implies that SPX is about to enter into a waterfall decline. Both of which appear to be the path of least resistance. SPX has tried bouncing each of the past 7 days to no avail, while the DX grinds up. Pretzel - when spending all day tying to get better handle on the 1 of 3 vs the 3 of 1 question. Came across another EW blog (not nearly as good as this bad boy :!) which was pondering 2008 vs 2011. He does a good job pointing out the similarities of the move from june thru july 2008 and the 1 of 3 wave then compared to the 1 of 3 wave now. In 2008 the 1 of 3 went for -220 spx points approx or about 15% and i think you mentioned that this 2011 wave will be like 2008 on steroids - so the -15% would take us down to 1050-1080 give or take. Maybe that fits because everyone is looking for the bounce so maybe noone gets it? Also something interesting in the fractals in 2008 - it looks like the maybe 1 time that spx poked itself up through the channel and almost immediately crashed afterwards - i am pretty sure the spx poked above the channel today in the E minis - we'll have to see how history repeats on that one. this would imply that the current decline would be a wave C down and not the start of wave 3. Not crazy about the blue a-b-c expanded flat. It's pretty hard to count the blue-a as a 5 -- I'd say it's a pretty clear 3. The c wave is also maybe too much out of proportion to the a wave. The count even throws in a failed fifth on c of blue b to complete the picture. A little too much conjecture overall, IMO. You don't even need to go that far, with the blue expanded flat -- you could simply count wave (1) as A and wave (2) as B to get to your C down. That's certainly technically possible, and something I intend to examine in great detail when it's appropriate. Doesn't seem to fit all the circumstantial evidence as well, but I haven't thrown it out by any means. I haven't worried about it too much yet, because it doesn't change the medium-term picture at all right now. Yeah, good thoughts. The e-minis did definitely break above the channel, but cash market didn't -- however, I don't use channels the same way in ES as SPX. The 24 hour market causes a sideways bias which tends to create false channel breaks. ty, Rob. Yeah, at this point, it seems like virtually every market is going to have to pull an amazing stick-save reversal for the SPX to get anything going beyond a one-day short-covering rally. Thanks for the 2008 Vix chart. Seems like Vix is not going to crazy spike until january at the earliest (expected SPX santa rally or wave 2 of minor 3) if history repeats itself. 1) The rally from the March 2009 counts very well as a completed corrective structure. 2) If we were to attempt to label the rally as an impulse wave, wave A (into April '10) would need to be labeled as wave 1; the flash crash would be labeled as 2; the rest of the rally would normally be labeled as 3, but there are problems with this. First, the current decline has crossed into the territory of what would be considered wave 1 -- that means this decline CANNOT be a fourth wave, with a fifth wave up yet to come. Due to that overlap, if we were counting it "bullishly" and trying to apply an impulse label to the March '09 rally, the only position the current wave could take would be as part of a nested 1-2 count. This would have the market about to launch into a massive third wave rally. And that's where you can't create your counts in a vacuum. You apply a level of fundamental analysis and awareness to your counts to determine what's merely "technically" possible, and what actually makes sense. Given the beginnings of worldwide debt implosion, I cannot imagine where the incredible amount of liquidity needed to drive a third wave of that magnitude could possibly come from. A wave that size is not a "QE2" type wave -- it's a QE2 x 10 wave. I simply can't see it happening from here, unless the world's landscape alters dramatically in the coming months. Last year Sept. 1, the world was in a much different place than it is now, as was the wave structure. Based on the length of sentiment extremes at the top, and the fact that most are "looking" for a rally at this point, even us bears, probably the biggest curveball would be to keep heading down for the time being. Just speculation, in answer to your question. Ya, there are many dip buyers here, it seems like many have forgotten how bearish sentiment was when we traded in the 1100-1220 range for two months. This should add fuel to the decline as they all rush to get out of each other's way at some point. DX is so close to breaking out right now and it seems like its just being ignored...good for the current bear case I suppose. There aren't very many dollar bulls out there (which is good since that means most are on the wrong side of the trade), but the few that see it coming have their heads on straight, enjoy. PL; morning my friend. I just read your response to my original question and can't agree more: we all expect a corrective rally at this point any time soon, so nobody get's it. hahaha! brilliant. A 2nd donation coming next week once i cashed in my first profits ever of a down market :-) Reading through other responses, I think 1050 area seems indeed where we are heading before we get the santa-bump. ps: looking at the weekly MACD, SSTO, CCI, RSI and going back to 2008, it seems IMHO like this week is at the exact same junction as the week of June 20, maybe June 13 2008. BUT, the market is unfolding much more rapidly than back then. Probably because it is the 3rd wave down, which is -according to those who know- faster (and more furious) than the 1st leg down. right!? If history is to repeat it self (first as tragedy, second as farce; Karl Marx) then we are in for a real tragedy. IMHO the santa "bounce" is therefore still very much in the cards. But as PL said; it will be a dead-cat-bounce. Not sure if I will chase it, but a few weeks of up-di-up would be fun to run, ya?! pps: sorry for all the posts but I forgot to mention the Bollinger Bands (BB's), and the weekly SPX candlesticks aren't even touching the lower band yet (just dropped below the mid), which has started to drop, (so did the upper band after have been going up until 2 weeks ago), This also indicates IMHO that the market will show more downside in the week(s) to come. Weekly RSI is dropping but "only" at mid-50s so not even oversold (the oversold area is below 30 -or 20 depending on who you talk to). CCI isat -47 and has another 200-300 points to drop before a new bottom is in. SSTO just topped and crossed down, so also showing more downside is in the cards. I know this an EWT blog, but I hope an interpretation of "standard" indicators add to PL's case as an independent 3rd-party confirmation of his analyses and predictions of the market. Btw, SPX dropped from 1440 to 1200 in the end-of-may (peak) to mid-july '08 (bottom) time frame. This is ~17%. Applying this to the ~1290 peak we could tentatively expect a low of ~1075 (which is in the area mentioned before by PL and others) before santa bounces back into the chimney. Congrats Arnie! I am shorter than I've ever been in my life, as a % of my investable assets, and I feel like I'm in a great risk/reward payoff structure. I may lose 20%, but I may make (with PL's help) 100%. And this next part I write to myself as a reminder - cut your losses and let your winners ride. It's the hardest thing to do, as we're all emotionally hard-wired from birth to do the opposite. william, thanks for the info! Just what we needed to hear! I've been on long-put mode for SPY all week last week. I prefer options above shorts as the risk of options is less (losing entire investment vs. owing unlimited amounts) than shorts and the profits are not much lower. Just "putting" it out there so people know there are different ways to make money in a bear market, besides shorts, with different risk/reward/pain levels. Your comments on the weekly chart indicator readings are duly noted; however, those same readings on the Daily Chart for the SPX are at or approaching some of the lowest levels we've seen in the last three years. I am in agreement with Pretz that we are likely to see plenty more movement to the downside over the intermediate term, but Pretz's first chart / count should serve as a warning over the ST.
We haven't broken the current downward channel, and I think it's highly probable that we could see a waterfall move next week. 1. To stave off mass fund redemptions heading into the end of the year. And thus preserve fund manager bonuses. I think this is a rather weak argument. 2. There are a LOT of Johnny Come Lately Shorts lately and the news reporting has been nothing but negative and encouraging going all in short or getting out of the market entirely in the last week. One strong retrace would clear them all out. And then the real leg down would commence, when the retail crowd is skittish about trying their luck short again below 1,200. This is a much more compelling and plausible scenario to me. If the above were to play out, it would mostly have ramifications if you are in December put positions that expire in three weeks. If you are simply in more traditional short and hold investments and can ride out a posssible 'wave 2' rally, then it probably doesn't matter. I myself have remained primarily for cash the last week and making very ST trades on the way down, since any true panic has not yet arrived. Though it certainly does appear imminent. I don't have the ability to forecast market movements like Pretz does, but I do weight my choices heavily in favor of the worst case scenario. And if the true waterfall 'wave three' scenario does unfold, I have the confidence that I have the discernment necessary to know when to move 'all in' decisively. to Vulture, for his *3rd* donation -- many thanks, Vulture, much appreciated! And to Tom H. for his donation. Thanks, Tom! A certain individual is visiting each of the "pages" on the site a bit TOO much. While I greatly appreciate the interest in the site, please limit your visits to each page to 1 or 2 each day -- otherwise it messes up my "pageview stats" and creates issues for me. Interesting -- is that a mechanical system that just gave a sell signal? Or is it done by an actual human? Schwab is a little late to the party here, lol. Happy Thanksgiving to all, and Pretz, the donation's in the mail. I covered on Friday with nice gains. Maybe I should have stayed short, but the only thing I had was a phone at my in-laws to trade with, so I stayed on the sidelines. Hope to get a setup on Monday. BTW, I hope I'm not the one messing with your pageview. I do hit the refresh button more than one or twice a day. I agree that the ST alternate shouldn't be summarily dismissed. I do all the work on the alternate counts to give people things to be aware of, and to serve as fair warning so readers don't get caught off-guard. If I thought there was zero chance of them occuring, I wouldn't bother putting the time in! Regarding the Johnny-come-lately (there's a new kid in town...) shorts, I'm not sure on that. I know a lot of bears who have been *closing* shorts here, and others who are afraid to go short now -- since all the indicators are indicating a bounce soon. Doesn't mean we won't get one, but it also fits w/ my third wave scenario (although, to be fair, this is still the first wave of the big third wave), where the market just keeps grinding lower despite the indicators. What I would really like to see on Monday/Tuesday is a big strong move down -- a move like that would tend to confirm the nested third ST count. If we get a weak move down, it would tend to add to evidence for the extended fifth. The issue I'm seeing now for the extended fifth, though, is there are so many related markets on the verge of huge moves (dollar, euro, oil), that there's going to need to be complete reversals across the board. Which is possible, since in a way, all it takes is "one" so to speak. If the dollar collapse, the euro would rise, oil would stabilize, equities would rally. But there's been a lot of technical damage to other currencies, even beyond the Euro -- even dollar/yen looks promising, etc..
At the moment, I continue to favor the more bearish ST count for this reason, but we could have a lot of answers as early as the Sunday futures session. I've seen bigger stick-saves from worse cliffs before, though, so we'll see what happens here. Lol, I hope my message made sense. Had to speak in gibberish. Let me add: feel free to hit refresh as much as you want... I am referring to specific page links that are being visited repeatedly. Hi Pretzel, in term of refreshing your page, I do tend to refresh every now and then to check the comments section. Does it cause trouble? I can see now that my message -- which unfortunately can't be crystal clear due to certain limitations I have in addressing the issue I'm trying to address -- is causing confusion. Divergences tend to coincide with ALL fifth waves, extended or not. However, another set of waves 1 and 2 can create the same type of divergence, which is what's causing the challenge here. If I solely went off the indicators, I would say "fifth wave." But there's more to it than that, some of which is outlined in my reply to Brian. I think I understand what you are trying to say now heheh..
Hope it didn't sound like I was trying to argue with your preferred count. What I posted was more centered around a perspective / possibility to consider for a holder of Dec SPY puts. Where the holder could be correct that the indexes are going to fall and pretty soon . . . but not until after Dec expiration. I'd hate to see someone holding a large put position simply run out of time. There is little question in my mind that the indexes have a LONG ways to fall and that the fall is going to happen. But if the 'Santa Rally' (which I agree seems unlikely) does play out, then Dec puts make no sense to be holding. You don't think there's a lot of recently added short positions last week? Hmmmm. I don't pretend to know, but I do know what the news has been TELLING people to do. Which always makes me nervous. An added note: Short term sentiment (as reported by Sentiment Trader) fell and went SHARPLY negative last week. With Intermediate Term sentiment also falling as well. Not at all! I was actually agreeing with you, that the alternate counts are there for a reason! I'd hate to see someone get burned on a large put postion too. As far as bears adding or covering, my evidence is only anecdotal, so I'm not sure either. I was just speculating a bit there. Brian, I see where you are coming from, and appreciate your concern, but remember that options (long-puts in this case) can be closed at any time and are mostly closed before expiry. As long as your strike price is above the current value of a ticker (for long-puts that is) there's no real reason to sweat it. Of course time-decay and volatility are an issue, but those are less crucial at this point in time (for say a Dec 30 expiry). Simply put in stop-losses, limit prices etc and voila; losses are minimized and profits maximized. Looking at daily based technical indicators, most are not at levels lower than the last 3 years and have still some room to drop. But, short-term, I agree that we'll see some upside soon. Though I think 1200 will even be tuff to break IMHO, especially considering how weak the market has been the last 2 trading days that are historically more bullish: the crash 2, seasonality 0. BTW, if anyone remembers me posting the Bradley Siderograph, which predicted a turn date on 11/23 (along with my comment that these types of timing tools are generally less-than-reliable)... that 11/23 date was a big whiff, especially since we made a lower low on Friday. I really think most of the instances where date timing predictions actually "hit" is purely random. It's almost amazing to me when they *don't* hit, since there's so many turns in the market on an average week. 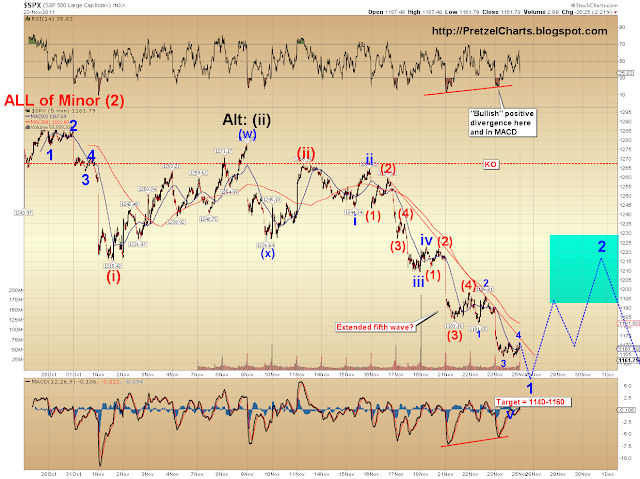 Hi Pretzel, Regarding PCLN - The current wave pattern since the top on 5/2/11 is considered an expanded flat correct? If 5/2/11 was indeed the top, is it the top of a 5th wave or a 3rd wave? 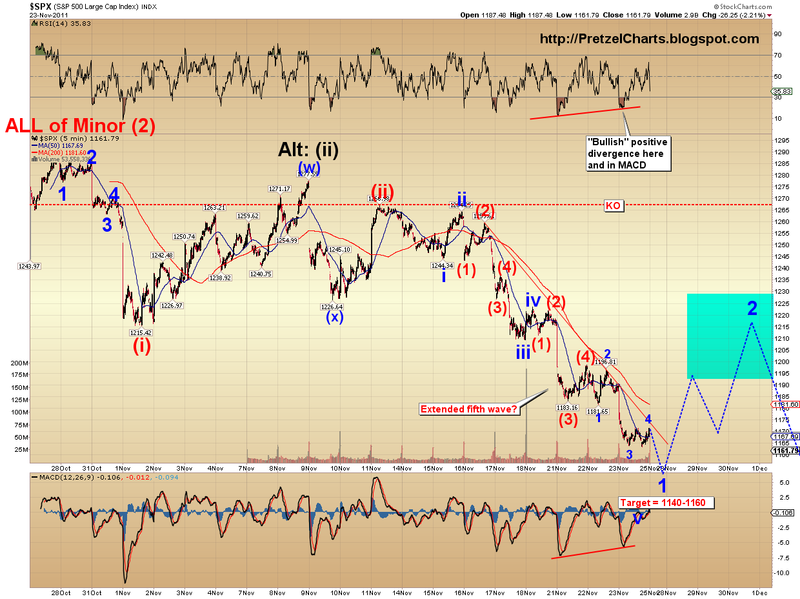 I would guess it would be the top of a third wave so we are now in a 4th wave decline for PCLN. Still learning.. thanks. Thanks for your reply. Really appreciate that. I am not that familiar with Elliot waves. I was looking from general market cycle point of view. Assuming 03/2009 as start of new bull market, I am considering this as second bull market correction (like May-Aug2010) and if bull were to continue it should start next leg up now. But as you said, this needs to be interpreted with keeping the fundamentals in context. The problem with fundamentals is usually they will be bearish near market bottoms and it is hard to distinguish them from real bear market conditions. And I think this is where we need PRETZEL's interpretation of market cycle!!! Thanks for all your good work and sharing your work with us. Hey Frank. Actually haven't even done a full count on PCLN. Sometimes, good old TA works just fine. I bought my puts just after the third failed backtest of the rising trendine. Also note the ugly top formation. Also, one more general question: parabolic moves - they usually coincide with the extended 5th wave moves correct? In commodities, yes. In equities, usually the third wave is the strongest, but there are always exceptions to the rule. Maybe if you look on my count you can see the shortcomings. I took the liberty and misused one of your counts as starting point. If that is not ok with you, sorry and I'll stop doing that. First question I have for you is where does this place us in your larger count? In other words, where I have Primary B, you have...? I'm guessing you're viewing it as part of a large triangle, and you have (a) or something similar? 1) First wave, where you've noted "never an impulse" -- I believe that counts reasonably well as a leading diagonal first wave. 2) The wave you label as "b" after the "dying 5" comment is most certainly an impulse wave. If you drop down to a one-minute chart, I see no way you can view that as a "b" wave. It is one of the cleanest impulse waves you'll ever see. You may not like the idea of a truncated fifth, but it actually becomes *more* likely, not less (IMO), after a monster 3rd that traveled as far and fast as that one did. 3) The "c" wave immediately following it *can* technically be counted as a five. But it's a pretty crummy "c" wave -- looks more like an ABC than a 5. 4) I agree that the ED is ugly. My preferred view is actually that the ED is the B wave of an expanded flat, with the recent rally being C. I often simplify my labeling, so as not to confuse my readers, since most are not well versed in Elliott. 5) The current decline being c of b is my ST bullish alternate count. For me, I have to reconcile counts at the shortest time frames. If I can't, such as in the case mentioned about your "b" wave, then I have a hard time slapping labels on them that don't fit -- regardless of how I "think" the market should behave. Beyond that, if this is wave 1, it's not unusual to have the "overshooting 4" as you call it (which actually doesn't overshoot, since it doesn't cross the price territory of 1). First waves are often a bit ugly, as the market is still deciding. I will come to your first question later. to 1) for a leading diagonal first wave the inside 3 is in my view a abc wave. And for me a third wave is crucial. to 2) and 3) you are right, here my count was too fast..., 2) b: this wave could be easy a 5 or a c. But I can count this wave as an fast and furious X wave. Then from the bottom of blue y a wxy up to X2. If I would count the b/x as an impuls, I would count it not in a 5 of a 3. But as a 5 of the first wave maybe. I attached my not-favorite scenario. to 4) if a B and not a V, then you have a 1//4 problem in your Impuls, aka we are in the correction. to 5) That I do not understand, do you mean c of b of red (2)? Guess so. There ya go! That one I can live with -- in fact, I talked about that possibility a couple months ago. Failed fifth wave of c of B wave. I stopped talking about it, because it's largely immaterial at this point... but there are several thing I like about that count. 2) X waves should be 3 wave moves, so X doesn't work for the impulse we discussed. Yeah, Elliott Wave is, IMO, probably the most challenging type of analysis out there. It's certainly the most time consuming! The chart you've been showing is one I've studied for a good 100 hours or more. I envy the guy you mention who gets to work focus on the DAX. DAX seems a lot cleaner most of the time (probably because there's not as much intervention from forces like the Fed). 16123, a drop of around 46% in a little more than 4 months. I plan to exit at support levels next week and reshort any bounce at ST resistance. Not sure, they have lots of metrics, but not sure if it''s a cookie-cutter algorithm or if human intervention is involved. I would guess purely algorithmic, but I don't know for sure. Looks like the PTB in Europe are trying out a few more grand solutions (in another vain attempt to forestall the inevitable): IMF to lend $795 billion to Italy at 4 to 5%. And ESFS to 'guarantee' up to 30% of all troubled countries' bonds. Will be curious to see if the equities markets buy what they're selling, at least for this week. If so, then the alt count may be in play. New guy here ... really nice blog PL. Is it just me, or is the wave that 'is a pain' looks like a sub-fractal? It will be interesting to see if the next week plays out as it forecasts (1250-ish?) before the big PUT Sleigh-ride in December. I wanted to be sure not to click on stand-alone pages too much, in order to not mess things up for you, but I don't know what they are. Can't any of the pages in your site stand alone? Congrats on your fantastic work predicting the waterfall! Very impressive. Supposedly the IMF (Read the U.S.) is going to bail Europe out. Wow, what great news for me as a U.S. taxpayer, LOL. BTW, thanks Jaco, for your explanation. Where does the IMF money come from? Futes up big. Looks like the IMF news is being bought by the gullible. Which may put off the day of reckoning (again). Which means we still have (as Pretz has put it) 'pay the bill time' coming eventually. And another 'stick save'. In the meantime, here comes the melt up and short covering rally a la much of October. Though I may have to adjust the odds there, depending on what happens over the next few days -- gaps across markets going to make things a bit more difficult. However, I would think that the extended fifth scenario now becomes far more likely -- I was giving it about 50% odds going into Friday, but with the giant stick save now in progress, that may change things. I don't have this as a 4th wave anywhere above. The count with the rally potential is that this is blue 1 of (iii) (or the bullish alt. count, but I still think that's quite unlikely). You'll recall we traded right into the target zone for that count on Friday, when I was warning everyone to be careful here. But, let's see what happens by the open. I still think the dollar has more upside, though it was getting due for a short correction, so maybe that's what's happening now. The extended fifth count was anticipating this type of rally, and the fundamental landscape hasn't changed at all. I suspect the market will realize that after the shorts get done panicking. Oh ok.. sorry I got confused. So extended 5th means end of wave 1 and then wave 2 retracement is in the cards. I was thinking this jump on the futures would end the wave 3, but we haven't finished the nested i-ii yet on that to conclude further crashing of wave iii. The nested 1-2 is, of course, hard for anyone to consider right now with the futures up 4 million points, but the technical invalidation of that count is still a ways up, at 1198.50. Also, keep in mind that what often needs to happen for a big decline is for shorts to get cleared out. Shorts are a huge source of support for a falling market. Getting back to above the 200 dma from HERE? Hmm, now THAT sounds like a true pipe dream. 1. A crashing bond market and astronomical yields. Above ALL ELSE, the welfare state and the financial apparatus that makes it all possible is what needs to be held intact here. 2. A crashing Euro. Necessary for the above. resume their attack on the European bond market. The IMF is not going to truly scare them away for good. And it's just a matter of time before this 'grand solution' will fail like all the others have. In the meantime, might as well enjoy the ride up while it lasts. PL -Great Blog, have been watching for a month or so. Just sent you a donation so you will keep up the good work.